I love the dictionary. Absolutely adore it. If I were ever stuck on a deserted island (am I the only Deb who has to stop and try to recall if that has already happened to her? ), the dictionary is the one book I’d want to have with me. Why not? It’s got all the other books already in it. And have you ever actually read the dictionary? (Do we proofreaders know how to have fun, or what?) Holy Mother of Merriam Webster – the wild and wacky things that book has in it! Then, of course, there’s the dictionary’s even prettier step-sister, the thesaurus. She doesn’t work nearly as hard, but oh the things she can do for a writer! But I guess it would be a stretch to say those two books changed my life. My writing? Yes. My life? No. For that I have to credit BIRD BY BIRD by Anne Lamott. And nothing can explain my feelings better than I can – and did – in a letter I wrote to her recently. Yes, it was my shameless plea to get her to blurb my book, but that doesn’t mean every word of it isn’t true. As a reader, I have been moved to laughter and to tears as you shared your experiences of raising your son, dredding your hair, giving up drinking and discovering God. I have been awed by your brave honesty and learned that it’s okay to be funny even about the stuff that on the surface, isn’t funny. And as a writer, I learned from your example that it’s always best to be exactly who you are (which for me, seems to be some weird amalgam of Gandhi, Che Guevara and Erma Bombeck). I knew I had a story to tell. Y’know: girl meets guy, girl falls in love with guy, girl goes off to the Peace Corps to prove she’s worthy of guy, girl has nervous breakdown and discovers repressed memories of childhood sexual abuse, girl and guy move to war-torn corner of Africa and have to contend with bouts of malaria and hostage-taking, outbreaks of civil war and then there’s the whole having a baby in the African bush thing. Oh and it’s funny. How can anyone write a book like that, I asked myself? Well, Anne Lamott does. And because you did, I knew it was possible to be funny and heartbreaking and above all, honest. Years ago, someone recommended BIRD BY BIRD and it quickly became my guide – to writing and to life. It’s the book that I’d recommend to everyone but wouldn’t lend to anyone. (Well, I finally did lend it to my friend, Jean, when she was struggling to get through leukemia and a bone marrow transplant. I think you’d approve.) And after twelve years of writing when my agent asked me for a major rewrite, I put my head down on my desk and cried like a baby. But when I was done with that, I remembered to just do it, bird by bird. And I did. p.s. join us at the Ball tomorrow and meet our very special guest author, Allison Winn Scotch! I love Bird by Bird, you’re right it’s a great book. That’s a moving letter, Eve! I’m with you on BIRD BY BIRD. The chapter on Jealousy is painfully hilarious, and I grapple with radio station KFKD on a regular basis. I completely agree–I recommend Bird by Bird to any author who is struggling with those critical voices in their head. I also love her book Operating Instructions about the first year of her son’s life. It’s the only book I’ve read that’s really honest about the ups and downs of becoming a mom. Thanks so much for the post. I am grappling with the re-write of my first novel and the night sweats are worse than the ‘M’ word. I just purchased “bird by bird” a month ago. Now I will definately read it! I can’t wait to read your book! And how on earth did you get stranded on a desert island? Also, I’m prone to reading the dictionary, too. Bird by Bird is a Life Manuel, plain and simple. Okay, so I see I am not the only writer in love with Bird by Bird. And you’re right Larramie, it applies to all of life, really – which I think is one hallmark of a great book. Jacqueline – when those night sweats keep you awake – you get to your computer and rewrite that novel! I truly, truly believe that the difference between those writers who get published and those who don’t is often a case of how many times they were willing to hear “no” and keep going anyway, or in other words, how many times they could stand to rewrite. Tiffany – I’m pretty sure I’ve never been stranded on a desert island! It’s just that, well, so many peculiar things have happened to me, that might not be so far fetched for me. Oh, now you’ll be disappointed, because, no, there is no getting stranded on a desert island in my book. But wait, there’s still hope! And if I ever do get stranded on a deserted island, you can be sure I will write about it! Meredith, I actually love all of Anne Lamott’s non-fiction books. I also love how she’s so honest about motherhood. That’s too rare. Hi there, Sue. Thanks for commenting! Look forward to hearing from you again. Kristina, KFKD? Okay, now I have to go back and reread it, because I don’t remember that part! 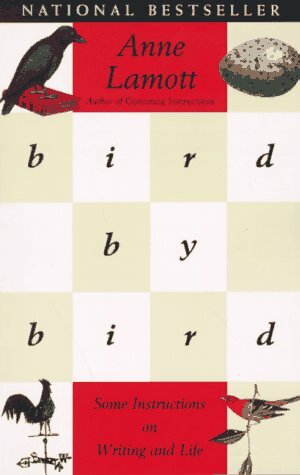 I love Anne Lamott’s non-fiction, especially Bird by Bird! (Is that the book where she talks about how her mind is a bad neighbourhood? Nope, I just looked that up and it’s a Salon post, which you can read here.) Gotta say this post has made me want to read your book too (even if Anne hasn’t blurbed it yet!). I’m also dying to read your book! I hope Ms. Lamott gets back to you, or (if she’s too busy) at least takes a minute to glow after reading your letter. I love the concept of “bird by bird.” Could actually come in handy right now for me, now that I think of it… off to draw a bird. I just tried to read Anne’s essay on Salon – and was loving it (gosh, I just adore her writing!) – but this obnoxious and huge ad for Australia kept popping up and blocking the whole damn Salon site – so I couldn’t finish it! Damn those ads and I WILL DEFINITELY NOT SEE AUSTRALIA – my form of protest. But I do like your site, Avisannchild and will certainly visit it some more (just promise no obnoxious pop-up ads! )and maybe add my own teaser if I can be clever enough. Katie – you won’t have to wait too long to read my book, but thanks. I, of course, look forward to reading yours as well! Now I’m starting to worry about my mom! Geeze, I finally got dressed and went shopping…so I just got online. Sorry Eve, I forgot Friday was YOUR day…anyway, how come you never gave me this wonderful book or mention it to me??? Umm, will have to buy it, now that I hear the publishing business is being smacked by our current financial crisis. Yeah, I know, I listen to too much political blather, but this was on NPR. NPR!!! I am reading Bleedin Kansas…pretty good read. Then I will read all the books you gave me, some written by this talented group. Now I am wondering what book changed my life…my life… not so much, but my ways of thinking about it…”Seat of The Soul”…Gary Zukov. There are a zillion book, fiction and non-fiction, that have given my life sweet, sweet hours of “vacations” without ever having to pack. A stack of books waiting to be read, piled high on my night table is my best present to myself, especially if it is raining or snowing…then it is non stop reading…no guilt. I have a question…have you ever finished reading a book that you had to force yourself to finish? I DID loan out my copy of Bird by Bird and it never came back! Somewhere out there, someone is enjoying it. I had to laugh when my sister bought me a copy of it for my birthday last year. She thought it was a birdwatching book! I think it’s in that book where she mentions that she thought having her book published would change her life, but it didn’t. Or maybe it was a later one? How do the Debs feel about that? True? Not? Absolutely one of my favorites, too, Eve! For some reason I had put off reading it for a long time, and when I finally did I could have cheerfully kicked myself, then read it again immediately. And add me to the list of those who can’t wait to read your book. Your posts are always fresh and honest and funny.